The Best Philanthropy Blogs from thousands of Philanthropy blogs in our index using search and social metrics. We’ve carefully selected these websites because they are actively working to educate, inspire, and empower their readers with frequent updates and high-quality information. Also check out Philanthropy Youtube Channels. About Blog This is a blog about the future. The year 2173 seems sufficiently far enough in the future to give us some perspective. As sure as we are of ourselves now, talking about the future - and making philanthropic investments - requires that we keep a sense of modesty and humor about what we are doing. Philanthropy is for the long-term - for the year 2173. Cambridge and San Francisco About Blog For more than a decade, CEP has led the movement to improve philanthropy through a powerful combination of dispassionate analysis and a passionate commitment to improving lives. Today, more than 300 foundations and philanthropic entities have used CEP’s assessments to gather honest feedback from their stakeholders in an effort to learn how to be even more effective. Foundation leaders, trustees, and staff, as well as major donors and philanthropic advisors, have come to rely on our research. Facebook fans n/a. Twitter followers 18,284. New York, NY About Blog Philanthropy News Digest (PND) a daily news service of the Foundation Center, is a compendium, in digest form, of philanthropy-related articles and features culled from print and electronic media outlets nationwide. Published daily, PND news items summarize the contents of original articles, press or news releases, and/or grantmaker communications. Facebook fans n/a. Twitter followers 50,204. Park Street, SE1 About Blog New Philanthropy Capital (NPC) is a consultancy and think tank that occupies a unique position between charities and funders, helping them achieve the greatest impact. We work with charities, professional advisors and funders, including foundations, individuals and families, government bodies and corporate funders. We help by offering strategic advice, grant-making support and bespoke research, and design evaluation frameworks and tools to collect and analyse data on impact measurement. Facebook fans 928. Twitter followers 19,809. Washington, D.C. About Blog The Chronicle of Philanthropy is an independent news organization that has been serving leaders, fundraisers, grant makers, and others involved in the philanthropic enterprise for more than 25 years. Serving nonprofit leaders, fundraisers, grant makers, and others involved in the philanthropic enterprise with news, advice, resources, and listings of career opportunities. Facebook fans 39,843. Twitter followers 208,146. Newcastle, New South Wales About Blog Created for managers and executives in the nonprofit sector working in fundraising, marketing, communications, philanthropic and leadership roles, F&P is regarded by many as an invaluable resource. Between its covers, you will find commentary and analysis on issues and emerging trends, fundraising case studies, giving news, professional development opportunities, best practice guidelines, strategy and management along with profiles on philanthropists and other significant people in the sector. Washington, DC About Blog The National Center for Family Philanthropy is the only nonprofit resource dedicated exclusively to families who give and those that work with them. NCFP provides research, expertise and learning opportunities to inspire our national network of giving families every step of the way on their philanthropic journey. Families learn how to transform their values into effective giving to achieve a positive and enduring impact on the communities they serve. Facebook fans 549. Twitter followers 9,543. Rhode Island About Blog Philanthropy Women is an online resource for women donors and their allies. We cover news, research, strategy and events related to funding for women and girls, grants for women and girls and gender equality philanthropy. Facebook fans 238. Twitter followers 5,701. Washington, D.C. About Blog NCRP promotes philanthropy that serves the public good, is responsive to people and communities with the least wealth and opportunity, and is held accountable to the highest standards of integrity and openness. We believe philanthropy at its best serves the public good, not private interests; employs grant making practices that most effectively help nonprofits achieve their mission; and strengthens democracy by responding to the needs of those with the least wealth and opportunity. Facebook fans 3,487. Twitter followers 21,116. San Francisco, CA About Blog The Open Philanthropy Project started with the question: How can we accomplish as much good as possible with our giving? Our mission is to give as effectively as we can and share our findings openly so that anyone can build on our work. Through research and grantmaking, we hope to learn how to make philanthropy go especially far in terms of improving lives. Facebook fans 2,002. Twitter followers 2,821. Boston, MA About Blog The Philanthropic Initiative (TPI) helps companies, foundations, families and individuals find innovative ways to maximize the impact of their giving. We are a philanthropic advisory firm that believes lasting impact starts with strategic thinking. We work with new and experienced philanthropists around the world. Our clients include major companies, leading foundations, and influential families and individuals who are eager to make their mark. Facebook fans n/a. Twitter followers 2,406. Cleveland and San Francisco About Blog Putnam Consulting Group provides a full range of advising and consulting services to help philanthropists achieve dramatic results with confidence and clarity. Headquartered in Cleveland, Ohio, we are privileged to serve grant making teams and foundation leadership across the globe. Facebook fans 50,045. Twitter followers 17,562. Boston, MA About Blog The Nonprofit Quarterly (NPQ) is an independent nonprofit news organization that has been serving nonprofit leaders, charitable foundations, educators, independent activists, and others involved in the civil sector for more than fifteen years. Follow to keep up with Investigative journalism for non profit organizations on philanthropy, fundraising, governance and policy. Facebook fans 26,108. Twitter followers 118,188. San Francisco, CA About Blog Our mission is more than just developing the best grant management software - though we take that very seriously. It's also about enabling a transparent, accessible, and more connected ecosystem for all funders and impact investors. Take your grantmaking to new heights with Fluxx’s robust automation, key integrations, and versatile reporting for grants, investments, employee giving, contracts, and more. Facebook fans 764. Twitter followers 1,870. USA About Blog Emerging Practitioners in Philanthropy (EPIP) is a national network of foundation professionals and other change makers who strive for excellence in the practice of philanthropy. EPIP's mission is to empower emerging leaders and elevate philanthropic practice in order to build a more just, equitable and sustainable world. Facebook fans 3,152. Twitter followers 3,145. New Zealand About Blog Philanthropy New Zealand is the peak body representing and supporting philanthropy and grantmaking in Aotearoa New Zealand. Our members include trusts, foundations, community groups, individuals, investors, local government and iwi. As the hub of philanthropy in New Zealand, we facilitate collaboration and offer practical guidance for anyone with an interest in giving to make the world a better place. Facebook fans 1,458. Twitter followers 1,152. San Francisco, CA About Blog Welcome to Reddit page of Philanthropy. Follow to keep up with Discussions & articles about philanthropy, non-profit development, smart giving, fundraising, and all related topics. Facebook fans 1,188,934. Twitter followers 548,746. Facebook fans 1,987. Twitter followers 7,079. College Station, TX About Blog At Texas A&M University's Mays Business School, we step up to advance the world’s prosperity. Our mission is to be a vibrant learning organization that creates impactful knowledge and develops transformational leaders. Mays Business School's vision is to advance the world's prosperity. Facebook fans 18,305. Twitter followers 14,650. About Blog A blog for charities and professionals on digital fundraising. Read inspiring stories, insights, tips and tools on using digital to reach more supporters and raise more for your cause. We help amazing people like you raise more money for the causes you care about. Facebook fans 261,356. Twitter followers 3,364. About Blog Shareable is a nonprofit media outlet and action network that empowers people to share for a more resilient, equitable, and joyful world. We inspire social change by publishing stories, analysis, and tools in collaboration with our global partners. Facebook fans 48,054. Twitter followers 29,479. Arlington, VA About Blog An active philanthropic network, the Council on Foundations, founded in 1949, is a nonprofit leadership association of grant making foundations and corporations. It provides the opportunity, leadership, and tools needed by philanthropic organizations to expand, enhance and sustain their ability to advance the common good. The Council empowers professionals in philanthropy to meet today's toughest challenges and advances a culture of charitable giving in the U.S. and globally. Facebook fans 8,984. Twitter followers 55,137. Marriottsville, Maryland About Blog DonorSearch is a leading provider of prospect research to nonprofits of all types, including charities, healthcare organizations, fraternities/sororities, religious organizations and educators. DonorSearch.net provides nonprofits with the best giving and wealth databases publicly available through ProspectView. Based off former major gift work experience, DonorSearch understands what it means to have actionable and accurate data that will actually enhance a development officer's work. Facebook fans 308. Twitter followers 1,183. About Blog eJewish Philanthropy highlights news, resources and thought pieces on issues facing our Jewish philanthropic world in order to create dialogue and advance the conversation. Striving to provide all our visitors with sustained access to external resources, we serve as an instant publishing channel highlighting the latest happenings in the world of Jewish philanthropy. Facebook fans 7,567. Twitter followers 16,244. San Francisco About Blog The NEO Law Group believes that healthy nonprofits are more effective at creating positive change. We help create and maintain legally compliant nonprofits that have strong foundations on which to build great programs. And we provide practical and affordable counsel, giving leaders reassurance and confidence to best further their valuable missions. Facebook fans 4,016. Twitter followers 4,769. Los Angeles, CA About Blog Causecast provides giving and volunteering technology solutions that help companies reach the highest levels of employee engagement and social impact. Learn how to engage employees, fuel business growth and drive positive social change through high-impact employee-led charitable giving and volunteering programs. Facebook fans 3,889. Twitter followers 18,732. About Blog Vanguard Charitable is a leading U.S. nonprofit organization that fulfills its mission to increase philanthropic giving by administering a donor-advised fund–a tax-effective way to consolidate, accrue, and grant assets to charity. Our philanthropic accounts offer donors a flexible and convenient way to give and, ultimately, help them make a greater charitable impact. About Blog Philanthropy Northwest is the network for philanthropists of all types who are committed to Alaska, Idaho, Montana, Oregon, Washington and Wyoming. We promote, facilitate and drive collaborative action by community investors to build resilient, equitable and inclusive communities. Facebook fans 3,259. Twitter followers 5,837. Jenkintown, PA About Blog National Philanthropic Trust is a public charity dedicated to increasing philanthropy in society. NPT provides philanthropic expertise to donors, foundations and financial institutions, enabling them to realize their philanthropic aspirations through the use of donor-advised funds and supporting organizations. Facebook fans 138. Twitter followers 8,780. About Blog Welcome to Clairification. Join me on the pathway to passionate philanthropy, not forgettable fundraising. A journey, not a destination. I'll be your guide, so you can be your donor's. Facebook fans n/a. Twitter followers 5,919. Orange, CA About Blog CHOC Children's is exclusively committed to the health and well being of children through clinical expertise, advocacy, outreach and research that brings advanced treatment to our patients. Facebook fans 66,559. Twitter followers 11,889. Palo Alto, CA About Blog The Science Philanthropy Alliance works to increase private philanthropic support for basic scientific research and discovery. The mission of Science Philanthropy Alliance is to increase philanthropic support for basic scientific research. We accomplish this by understanding the opportunities and complexities philanthropists face in funding basic science, and providing advice and learning opportunities for individual philanthropists and foundation staffs on how to support basic research. Facebook fans 655. Twitter followers 619. San Francisco Bay Area About Blog Luminare Group works with courageous, new and seasoned leaders and organizations that are addressing disparity and dismantling structural barriers to equity. We believe we have a moral imperative to do our work differently. By investing in new practices and interrupting existing habits, we help organizations have deeper impact. We partner with you to illuminate your best intentions and the highest and best use of resources. Facebook fans 79. Twitter followers 121. About Blog HistPhil is a web publication on the history of the philanthropic and nonprofit sectors, with a particular emphasis on how history can shed light on contemporary philanthropic issues and practice. In founding and editing this blog, we hope to foster humanistically oriented discussion and debate on the sector and to bring together scholars, nonprofit practitioners, and philanthropists in common dialogue on the past, present, and future of philanthropy. Facebook fans 122. Twitter followers 1,112. East Africa About Blog Established in 2003, the East Africa Philanthropy Network (EAPN) -formerly East Africa Association of Grantmakers (EAAG), is a membership association that brings together trusts and foundations in the East Africa region with the aim of promoting organised philanthropy. EAPN seeks to provide a platform for promoting indigenous philanthropy, strengthening the credibility of grantmaking institutions, and act as an intermediary between the civil society sector, Government and private sector. Facebook fans 792. Twitter followers 2,393. About Blog Keith Thomson is a Toronto philanthropist consultant and estate planning shares his thoughts on how Canadian philanthropy can transform your life. Toronto, Ontario About Blog Maeve Strathy is a passionate fundraising professional, focused on inspiring donors to make an impact on the causes they love through philanthropy. Her full-time work is as a Fundraising Strategist with Blakely, providing strategy for charities on integrated direct response campaigns. Facebook fans n/a. Twitter followers 4,256. About Blog The Philanthropy Roundtable is America’s leading network of charitable donors working to strengthen our free society, uphold donor intent, and protect the freedom to give. Our members include individual philanthropists, families, and private foundations. New York About Blog Welcome to Nonprofit Bridge Blog. I intend to write about my thoughts about dealing with change, acceptance, as well as nonprofit technology where I make my living. Since I believe in looking for the good in every day, this will also be a place for positive thoughts. Stay tuned. Facebook fans n/a. Twitter followers 2,944. Milwaukee, WI About Blog The Wisconsin Philanthropy Network (WPN) is a professional membership association for grantmakers from across the state. As Wisconsin’s premier resource in philanthropy, we are committed to making your giving as effective and meaningful as possible by providing networking opportunities, skill building, and customized research services tailored to your needs. Haddonfield, NJ About Blog The Community Foundation of South Jersey (CFSJ) helps South Jersey residents harness the power of philanthropy to transform their community and the issues they care about most. The Foundation helps donors to create funds—both large and small—achieve positive results with their generosity in South Jersey and beyond. By working with the Community Foundation donors can engage in philanthropy that is innovative, visionary, and effective. Facebook fans 410. Twitter followers 609. About Blog Main Street Philanthropy inspires future generations to become passionate philanthropists. We lead small teams of students and their classroom teacher through a truly transformational experience that builds new philanthropic leaders for tomorrow. 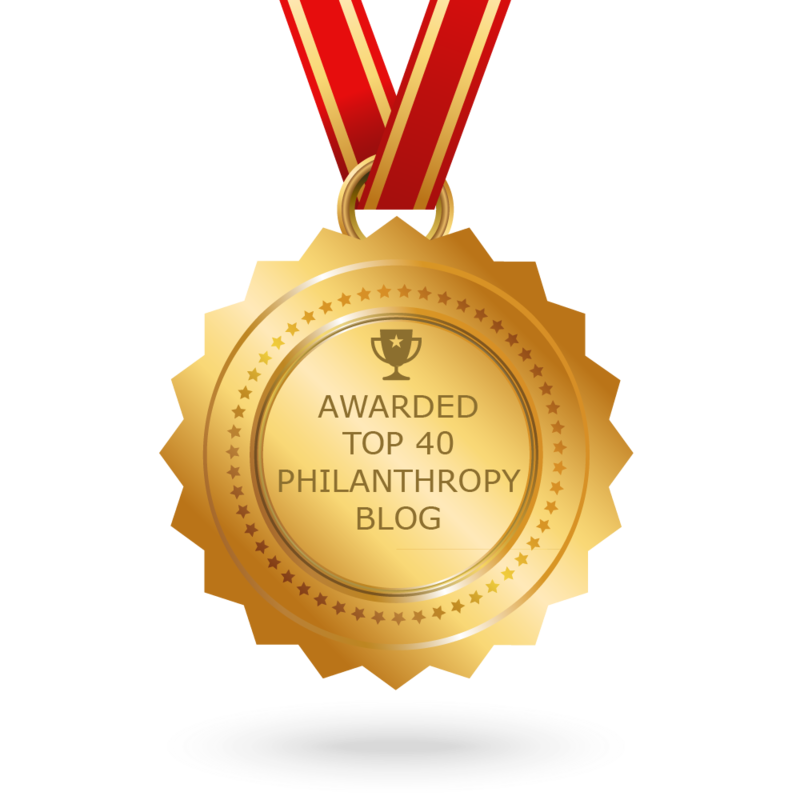 CONGRATULATIONS to every blogger that has made this Top Philanthropy Blogs list! This is the most comprehensive list of best Philanthropy blogs on the internet and I’m honoured to have you as part of this! I personally give you a high-five and want to thank you for your contribution to this world.